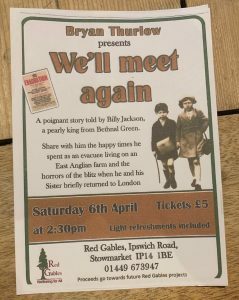 “We’ll meet again” at the Red Gables (Ipswich Road Stowmarket IP14 1BE) in aid of their Charity projects: Tickets £5. Refreshments included. Saturday 6th April at 2PM.